Palm oil (elaeis guineensis) is a tropical vegetable oil derived from the pulp (mesocarp) of the palm fruit to yield crude palm oil (CPO) and from the fruit kernel (endosperm) to yield palm kernel oil (PKO), both of which differ in quality, density, composition, and end application. It is a super crop that is the world’s most consumed edible oil, comprising over half of all packaged products consumed globally. Beyond its food applications, palm oil is one of the most versatile raw material/substrate bases known to industry, cutting across industries from food to cosmetics, chemicals to energy, and pharmaceuticals to animal feed. 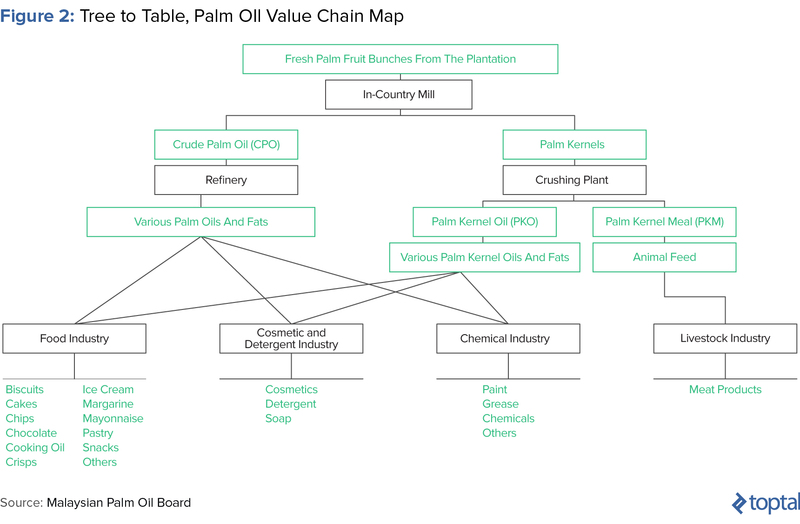 As an investment, efficient palm plantations (upstream) boast 50% – 60% EBITDA margins for mature fields; 3% – 12% margins for midstream (crushing, refining, and processing); and 15% – 25% for downstream. 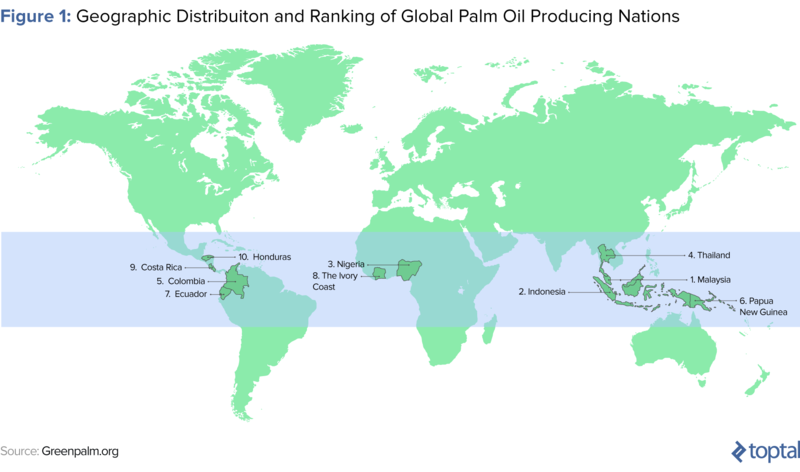 Which countries are the largest producers of palm oil? Palm oil production is an effective oligopoly, dominated by two countries: Indonesia (53% of global output) and Malaysia (31% of global output). Together, these markets account for 84% of global CPO volumes. Recently, Nigeria, Thailand, and Colombia have been emerging as more relevant global producers, collectively accounting for an incremental 7% – 8% of total global CPO output and rising. What are the different ways to invest in palm oil? Investors seeking to gain exposure to palm can do so in two ways: (1) by investing in real assets and (2) by investing in financial instruments. Real asset investing includes investing in any of an upstream plantation, midstream processing assets (e.g., crushing mills, refineries, or oleochemical plants), or downstream assets (e.g., vegetable oil, soap, or other consumer discretionary brands). Financial assets include publicly traded equities, publicly traded debt, or palm oil futures. For the novice or otherwise uninitiated, the importance and ubiquity of palm oil as a global commodity can never be overstated. It is a super crop that comprises over half of all packaged products consumed globally, is the world’s most consumed edible oil, and is one the most versatile raw material/substrate bases known to industry. Its applications cut across industries from food to cosmetics, chemicals to energy, and pharmaceuticals to animal feed; and its profit profile is so lucrative that it has literally seen to the rise and fall of many an emerging market regime. Palm oil, for decades, has been the quiet stuff of legends. But despite its success as a crop, palm oil’s planting, cultivation, and harvesting process presents material sustainability challenges that threaten its future prolificacy. These challenges include deforestation, greenhouse gas (GHG) emissions, child labor and community exploitation, and conflict: challenges that influence the industry’s demand-supply balance, and thus its pricing and investment dynamics. This article presents you, our uninitiated finance enthusiast, with the sparsely understood world of palm, exploring its cultivation, harvesting, and application process; its financial and investment profile; and ultimately the trends governing its future. Palm oil (elaeis guineensis) is a tropical edible vegetable oil derived from both the pulp (mesocarp) of the palm fruit, yielding crude palm oil (CPO), and from the palm’s fruit kernel (endosperm), yielding palm kernel oil (PKO); oils that differ in quality, density, composition, and end application. Palm oil, which we will refer to herein as CPO, accounts for 35% of the world’s vegetable oil market. The oil palm tree grows under strict agro-ecological conditions only found in tropical regions that fall within 10 degrees north or south of the equator. These regions must be characterized by abundant levels of rainfall throughout the year, given the perennial profile of the crop, with minimum rainfall of approximately 325 liters per day per planted tree. As of 2016, there were 17 million hectares of mature palm oil plantations across the equator, producing a total of 65 million tons of CPO for global consumption. By way of context, the next largest global vegetable oil by volume is soya bean, which had 120 million planted hectares producing 48 million tons of soya oil as of 2016. Since 1980, palm oil production has been dominated by two countries: Indonesia (53% of output) and Malaysia (31% of output), which collectively account for 84% of global CPO volumes. Recently, however, Nigeria, Thailand, and Columbia have emerged as globally competitive players, collectively accounting for another 7% – 8% of total global CPO output and rising. Commensurately, the world’s largest consumers of palm oil are India and China, who import 21% and 16% of the world’s CPO, respectively, followed by the European Union—specifically, Italy, the Netherlands, Spain, Germany, and the UK—whose confectionary and biomass industries collectively account for another 7% – 8% of global consumption. The palm oil value chain is thought of and structured similarly to that of the crude oil (petroleum) industry. It is comprised of an upstream segment (planting, cultivation, and harvest), a midstream segment (refining and processing) and a downstream segment (retail of end-products, brands, and industrial derivatives). Palm oil is planted in two stages. The first, the nursery stage, involves artificially germinating palm seeds (slightly larger than grapes) in plastic containers and growing them in controlled net houses. At the three-month mark, these germinated plants are transferred to an open field for another 6 – 8 months (yielding a total of one year), until final transplantation to an open field. Here, the young palms are planted about nine meters apart, resulting in 128 to 140 trees per hectare. Oil palm generally begins to bear fruit 30 months (two and a half years) after field planting, with commercial harvest commencing six months later. However, the yield of an oil palm tree is relatively low at this stage and remains so until year seven. It is only at year seven that the tree reaches peak production, where its output remains until its 18th year, after which it begins its decline. The typical commercial lifespan of an oil palm tree is approximately 25 years. Fully mature oil palms produce 18 to 30 metric tons of fresh fruit bunches (FFB) per hectare. The yield depends on a variety of factors, including age, seed quality, soil and climatic conditions, quality of plantation management, and the timely harvesting and processing of FFB. The ripeness of FFB harvested is critical in maximizing the quality and quantity of palm oil extracted. At this juncture, it is important to note that the first eight years are really the most critical to a plantation’s success and where an experienced management team is critical. Details such as a sub-optimal spacing between trees during planting, an ineffective irrigation system, poor fertilizer, water inefficiency, and insufficient disease control can result in a sub-optimized upstream investment for the remaining 22-year duration of the plantation’s life—an expensive and often devastating mistake made by inexperienced plantation owners. The milling of fresh fruit bunches (FFB) must take place within 24 hours of harvesting to minimize the buildup of fatty acids that lower the commercial value of the processed palm. FFB are first transferred to the palm oil mills for sterilization (high-pressure steam), whereupon the palm fruits are enzyme-deactivated and separated from the palm bunches. After steaming, the palm fruitlets are crushed in a pressing machine to obtain the palm oil. As previously mentioned, the palm oil palm comes in two types: CPO from the flesh of the fruit, and PKO from the seed or kernel. For every ten tons of CPO derived, one ton of PKO is produced. For CPO, waste and water is then cleared and separated from the CPO by means of a centrifuge. The cleared CPO is then sent for refining, while the palm kernel nut is sent for crushing. The empty fruit bunches and liquid waste arising from the process are recycled as fertilizer in the plantations. Both CPO and PKO then go through a second stage of refining where impurities, colors (by bleaching), and odors (by deodorizing) are removed and the oil is processed into different grades via fractionation. The output of these processes are palm stearin (solid at room temperature) and palm olein (liquid at room temperature) fractions, whose different properties make them suitable for a variety of food and non-food products. The downstream segment of palm oil simply represents the retailing of the end-derivatives/products produced by the refining process. These include palm olein (CPO), palm stearin (CPO and PKO), palm kernel cake (PKO), and other substrate bases. Of the various derivatives, CPO olein and stearin are the leading segments among palm’s derivatives, owing to their versatility and application range, from edible oil, surfactants, and cosmetics to biofuel, animal feed, and lubricants. Food: Palm oil is the major ingredient in cooking oils, industrial frying fats, margarine, vegetable ghee, confectionary, ice cream, non-dairy creamer, salad dressing, cheese analog, supplements, and condiments. Cosmetics and Personal Care: Palm is one of the major ingredients in most cosmetic products. It is used widely in balms and lipsticks due to its luster and color-holding aspects; in soaps, candles, and detergents due to its texture; and as a base ingredient in creams and skin-based pharmaceuticals (especially anti-aging products) because of its tocopherol and tocotrienol properties, both known to be absorptive, healing agents. Oleochemicals: Oleochemicals are the oils and fats derived from natural plants and animals subsequently broken down into fatty acids, esters, glycerol, and others. Palm oil is a raw material in oleoresins, used in the production of surfactants, agrochemicals, lubricants, grease, industrial cleaning products, and printing ink. Energy and Biomass: Palm oil is used as cheap feedstock for the many biodiesel plants across Southeast Asia and Europe, an end application that has been one of the major drivers of palm’s recent success and growth. Livestock: Palm kernel, due to its high average protein level of 22%, is a fantastic but cheap source of nutritional value in animal feed and supplemental products. As of year end 2015, 62 million metric tons of palm oil were produced with a production value of $65.7 billion. Over the last two decades, palm oil production has grown tenfold (at a YoY CAGR of 7.5%), with estimates that production will reach $93 billion by value or > 70 billion tons by volume by 2021. The historical success of oil palm can be attributed, principally, to its intrinsic qualities. 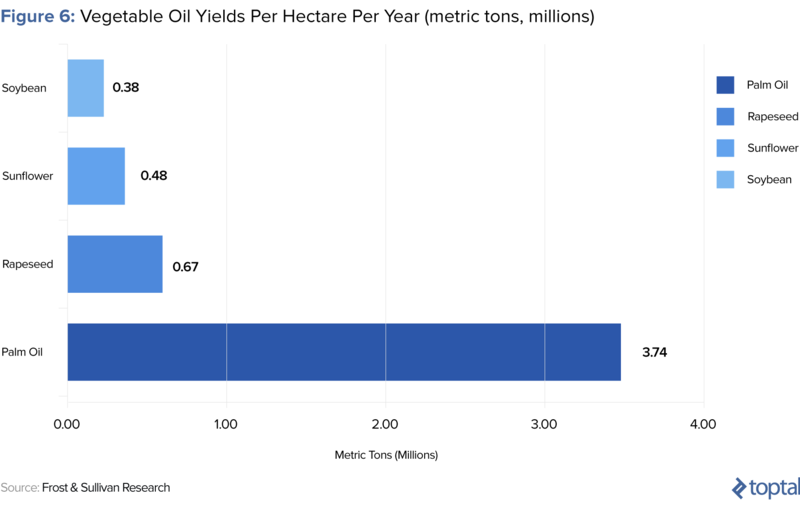 First, it is the most productive of all the vegetable oil crops globally, yielding 7x and 11x more oil per hectare than rapeseed and soybean, respectively, which exist as the two next most productive oils. Secondly, palm oil is one of the most versatile and widely applied substrate bases globally. Specifically, the food sector consumes about 70 percent of all palm production, but as presented in previous sections, it is also used as an input base for everything from margarines, soaps, lipsticks, and polishes to confectionary, cooking oils, surfactants, and industrial lubricants. 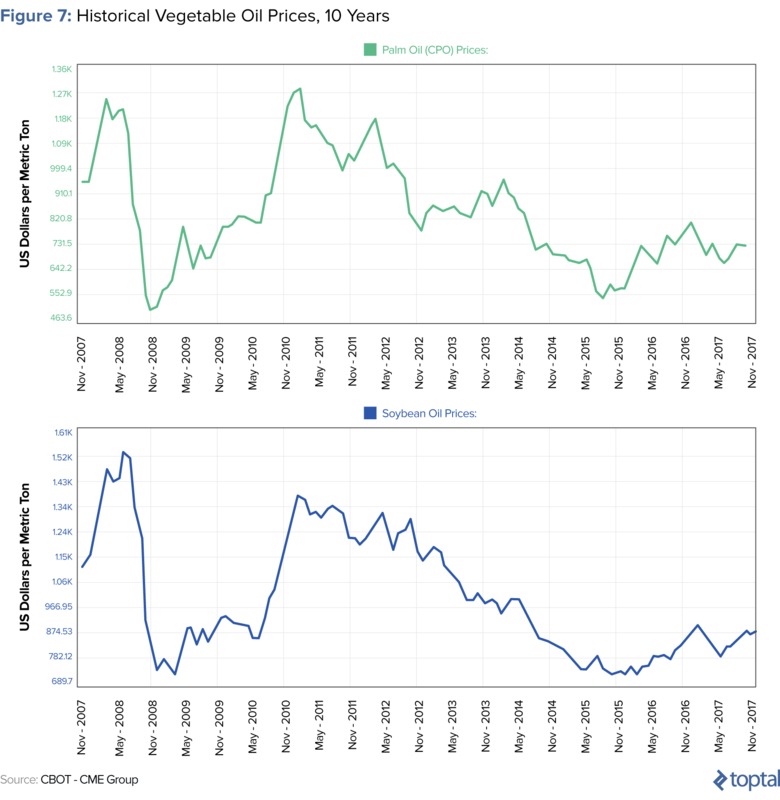 Third, palm oil is the most price competitive of the global edible/vegetable oils, historically trading at 0.85x the price of soybean oil and 0.9x the price of coconut oil (PKO). Recently, the affordability of palm oil has driven its continued demand in high-consuming emerging markets such as India and China and also across Africa—an end market that is fast becoming a material consumer of the commodity on the back of its explosive demographic growth. Looking forward, most of the legacy drivers of palm—productivity, versatility, and value—will continue to hold. In addition, demographic growth, improvements in economic conditions/standard of living, and associated changes in dietary habits will also contribute meaningfully to the consumption-driven growth of palm. Specifically, India and China respectively consume 21% and 16% of the world’s CPO today, representing approximately 16 kg and 21 kg of vegetable oil per capita. Compared to the 67 kg per capita consumed by the West, there remains plenty of runway for further consumption upside in emerging market food segments, which will account for the bulk of palm growth and demand. Note that these stats are ex-Southeast Asian consumption, which, according to research boutique Frost & Sullivan, is slated to grow at a CAGR of 11% over the next three to five years, driven primarily by domestic Indonesian consumption. Further, new demand markets, such as biodiesel, which uses palm oil as feedstock, have and will continue to emerge as a powerful driver of growth. Biodiesel now consumes around 20 million tons of vegetable oil on a global basis, equating to approximately 13% of vegetable oil usage. It is worth noting that many countries, Southeast Asian and Western alike, have introduced biodiesel mandates whereby a minimum quantity (20% in Indonesia and China) of palm oil-based diesel must be blended with traditional diesel as a going energy concern. These policies have effectively set floors on the palm oil-based biodiesel demand for years to come, and as a consequence increased the crop’s correlation to energy (crude oil) prices, which has the effect of propelling CPO prices into a new trading range. The final major driver of forward-looking palm oil growth is “sustainability factors.” Specifically, there has been rising hostility and policy against GMO-based oils in Europe and an outright ban on trans-fat foods in the US, both of which have resulted in a migration away from soybean and sunflower oil toward palm oil as a raw material base in food. Each of these classes have their merits and demerits, profit profiles, and risks, with upstream plantations being the most lucrative. From a financial market perspective, palm oil production and trading companies are principally listed across four global exchanges: (1) Malaysia’s Stock Exchange (Bursa Malaysia/MYX); (2) the Indonesian Stock Exchange (IDX); (3) the Stock Exchange of Singapore; and (4) the London Stock Exchange (AIM). As of Q3 2017, the listed value or aggregate market capitalization of the palm oil sector was $85 billion, with a capital value of approximately $200 billion, according to Hardman & Co, a capital markets research company. Amongst the public exchanges, Malaysian assets command premium valuations with the EV/ha range $10,000 – $44,000 but with valuations typically clustering in a tighter range of $14, 000 – $23,000, while Indonesian valuations exhibit lower clustering, ranging from $8,000 – $17,000 EV/ha. Given that the Singaporean listed planters are largely Indonesian plantation holders and operations, their valuations mirror those of Indonesian listed companies. African valuations, typically listed in London, are lowest in class, ranging from $7,000 to $16,000 but concentrating mostly in the range of $7,000 – $10,000 EV/ha. At this juncture, it is important to note that because Malaysia and Indonesia represent a global production oligopoly with 85% production share of palm oil volume, much of the following analysis will focus specifically on their dynamics and relative to one another. As previously stated, Malaysia listed and operated companies command a premium over other global palm oil companies, for a number of reasons. First, they exhibit a higher incidence of horizontal and vertical integration and diversification relative to their Indonesian and African counterparts. 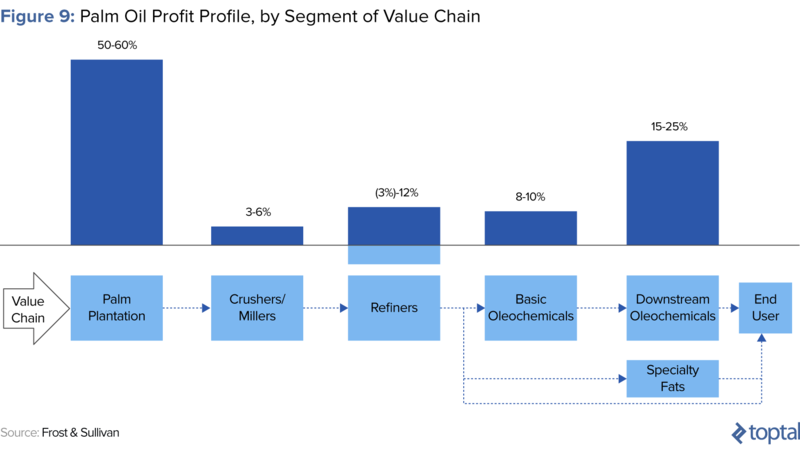 The largest listed Malaysian palm oil companies often have in-house mills, processing and refining capacity, and branded FMCG brands (vertical integration). The most mature of these companies also hold vast commercial and residential property holdings, and they run agro-industrial operations as well as other, somewhat tangential business units ranging from healthcare to auto distribution. More to the pro, these companies also often have cutting-edge R&D capabilities in-house that have led to higher FFB yields and more efficient chemical operations relative to their Indonesian and African counterparts. 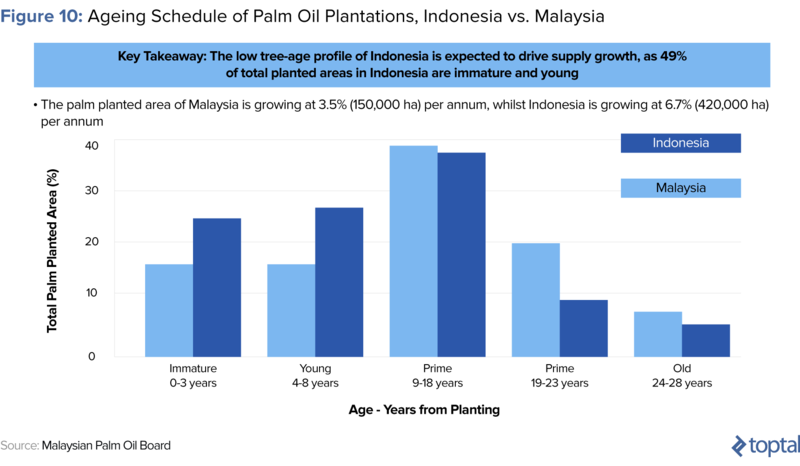 The second driver of Malaysia-listed valuations is the higher incidence of prime age plantations in the country relative to Indonesia and Africa. The result is a higher FFB yield ratio relative to Indonesian plantations currently but a projected inversion of this relationship over the next ten to fifteen years at current planting rates in Indonesia relative to Malaysia. The final driver of Malaysia-listed valuation premiums is the lower incidence of government involvement in the sector relative to Indonesia, especially with regard to socially volatile smallholder schemes. Specifically, smallholder farmer schemes only account for a 14% share of plantation ownership (compared to 42% in Indonesia) with the government directly holding another 24% and the private sector controlling ~62% (vs. 50% in Indonesia). Indonesian and Singaporean listed companies, both of which are comprised of Indonesia-based plantations, tend to trade at a discount to Malaysia listed companies. The first reason for this is Indonesian plantations in general tend to be far less vertically integrated and diversified than their Malaysian counterparts, and are thus more susceptible to concentrated swings in commodity prices and sector-specific issues that might create short term demand-supply imbalances. By way of illustration, in recent years, Indonesia has been plagued by a number of ongoing community issues that have led to the government reallocating large portions (up to 30%) of private palm land to smallholder farmers. This, coupled with the fact that Indonesia consumes 25 – 30% of all palm oil it produces, domestically, relative to Malaysia’s 12% – 15%, led to lower domestic CPO prices and an impact to the bottom line of Indonesia listed companies. The perception of such concentration risk and exposure is but one reason why the markets tend to treat Indonesia listed companies as riskier bets than their Malaysian counterparts. The second reason why Indonesian companies tend to trade at a discount to their Malaysian counterparts is that Indonesia’s government is in the midst of driving a mandate to accelerate the development of local refining and downstream capacity reflected in the recent implementation of a CPO export tax regime. Specifically, Indonesia has lowered the export taxes of processed palm oil products but raised dramatically the taxes on CPO—a strategy that is broadly reflective of the more hands-on approach by the Indonesian government—in an attempt to control supply and demand dynamics of palm oil in the near to medium term. According to Hardman & Co, a global agri-research house, the third reason why Indonesian companies tend to trade at a discount to their Malaysian counterparts is due to operational efficiency. Cost per ton of CPO varies from operator to operator and region to region, with Indonesia reflecting a higher cost per ton than Malaysia due to its weak and decaying transportation infrastructure. Typically the cost of production range is $380 – $550 per MT, with >$380 per MT being possible only for mature estates found in greater concentrations in Malaysia. As mentioned much earlier in this article, with the runaway success of palm oil has also come large-scale social, environmental, and sustainability challenges: challenges such as deforestation (resulting in the extinction of a number of endangered species and bio-ecosystems), greenhouse gas (GHG) emissions (palm oil is estimated to account for 4% of GHG emissions globally), child labor exploitation, and social conflicts with local communities. Each of these categories impacts the growth and thus investment prospects of the palm oil sector as a whole. By way of illustration, climate change creates more erratic weather patterns and variations in temperature, resulting in more instances of prolonged drought as well as severe flooding, which can degrade and inundate farms and livestock operations. El Niño represents the most recent case in point, reducing palm oil yields globally by 30% in 2015/2016. By way of a second illustration, numerous lawsuits have been brought against palm oil plantation owners, spanning issues from deforestation to global warming contributions and working condition abuses, with the Government of Indonesia recently prosecuting publicly traded companies associated with air pollution produced by palm oil fires. In 2004, an industry group called the Roundtable on Sustainable Palm Oil (RSPO) was formed to work with the palm oil industry to address its environmental concerns. The EU in particular, as the third largest importer of palm oil globally, has been especially disciplined about enforcing RSPO compliance terms by exporting planters it trades with. 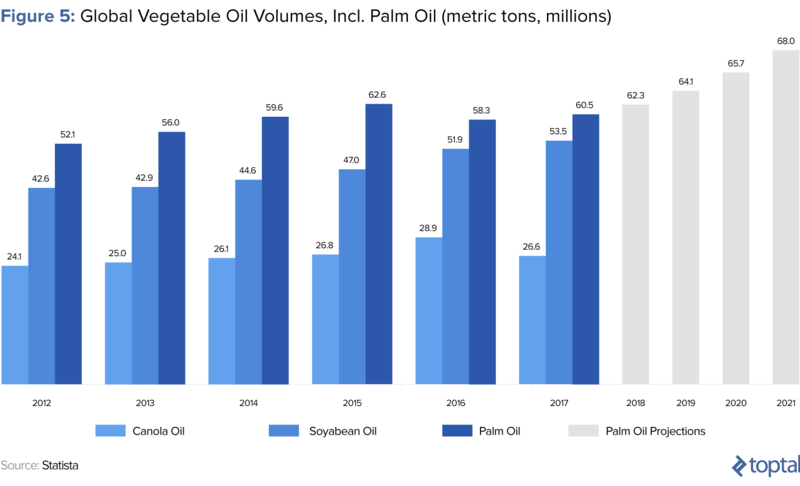 Current sustainability headwinds notwithstanding, palm oil is well positioned to continue its ascent as a global super-commodity well into the future. The global palm market is forecast to exceed 70 billion tons of output value ($93 billion worth of financial value) by 2021, driven by increased demand for sustainable palm in edible and non-edible food applications, biodiesel growth, and increased hostility toward GMOs and trans-fat oils by the West. As expected, not far behind these fundamentals is technology, which is poised to play an ever-larger role where data aggregation, yield propagation, and sustainability are concerned, with startups such as Poladrone and Litchi leading the way. With these positive tailwinds combined, continued dedication by planters to adhering to the RSPO’s sustainability parameters, and Africa stepping up to make up for the land shortages becoming more acute in Southeast Asia, palm oil will undoubtedly be a dominant force for decades to come. Palm oil (elaeis guineensis) is a tropical vegetable oil derived from the pulp (mesocarp) of the palm fruit to yield crude palm oil (CPO) and from the fruit kernel (endosperm) to yield palm kernel oil (PKO). What are the end uses of palm oil? The end applications for palm oil are vast, and include food (cooking oils, frying fats, confectionary), cosmetics (lipsticks, balms), anti-aging pharmaceuticals, oleochemicals (grease, lubricants, industrial cleaning products), feedstock for biomass, and animal feed. 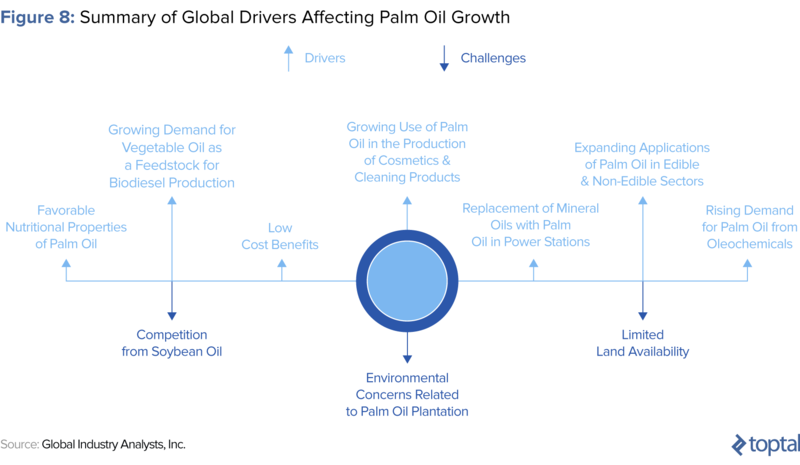 Investors seeking to gain exposure to palm can do so in two ways: (1) by investing in real assets (upstream plantations, midstream refineries, or downstream brands); and (2) by investing in publicly traded financial instruments (publicly traded equities and debt, palm oil futures).